NCDOT Ferry Division Director Harold Thomas, Blackbeard 300 Committee Chair LaRae Umfleet, and Ferry Division Deputy Director Jed Dixon display one of the Blackbeard flags to fly on North Carolina ferries this year. Ferry Division, Department of Natural & Cultural Resources observe 300th anniversary of Blackbeard's demise. Ahoy, mateys! If ye be sailing for Ocracoke or Bath this year, be prepared to do so under the black flag of the dreaded pirate Blackbeard. 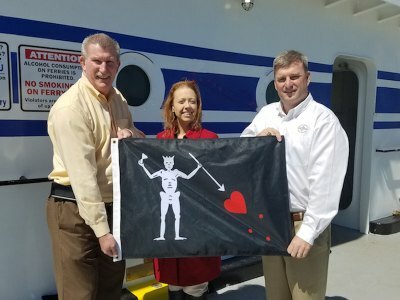 The North Carolina Department of Natural and Cultural Resources has teamed up with the NCDOT's Ferry Division to fly the flag in observance of the 300th anniversary of Blackbeard's death in 1718. "We're honored to take part in this celebration of an important piece of North Carolina history," said Ferry Division Director Harold Thomas. "It will be a reminder for all of our passengers that they're plying the same waters that Blackbeard sailed 300 years ago." The Department of Natural and Cultural Resources is leading the charge in the state's official observance of the Blackbeard anniversary, and purchased the flags to install on the ferries. "We are so thrilled that the Ferry Division agreed to partner with us to commemorate the Blackbeard 300th anniversary this year," said LaRae Umfleet, chairwoman of the NCDNCR's Blackbeard 300 Committee. "We're not only celebrating Blackbeard and the golden age of piracy, we're also celebrating North Carolina's maritime history, and the ferries have been a part of that history for 75 years." The Blackbeard 300 Committee will be hosting exhibits, educational opportunities and events throughout 2018. The anniversary will wrap up at Blackbeard's Pirate Jamboree in Ocracoke, Oct. 25-28. Learn more about Blackbeard and find a complete schedule of events at www.ncdcr.gov/bb300.